Palladium, Blue sapphires, white diamonds, green diamonds (HPHT color treated). "My thirst, my boundless desire, my shifting road! ― Pablo Neruda, Twenty Love Poems and a Song of Despair. One of five rings inspired by the love poems of Pablo Neruda. 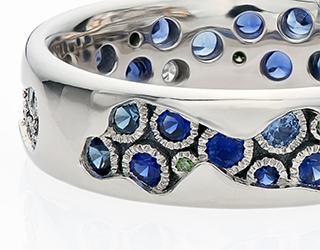 Shown here set with precision cut sapphires and diamonds.